BACKGROUND AND PURPOSE: Studying imaging findings of non–acquired immunodeficiency syndrome (AIDS) primary central nervous system lymphoma (PCNSL), we hypothesized that the imaging presentation has changed with the increasing incidence of PCNSL and is related to clinical factors (eg, time to diagnosis and the patient's being diagnosed alive or at postmortem examination). MATERIALS AND METHODS: Chart and histologic reviews of patients recorded as having PCNSL during 1989–2003 in the Norwegian Cancer Registry identified 98 patients with non-AIDS PCNSL; 75 had available imaging. CT and MR images from the first diagnostic work-up after onset of symptoms but before histologic diagnosis were reviewed. RESULTS: CT and/or MR imaging in the 75 patients revealed no lesion in 10 (13%), a single focal lesion in 34 (45%), multiple focal lesions in 26 (35%), and disseminated lesions in 5 (7%) patients. All together, we identified 103 focal lesions (single/multiple): 63% in white matter, 56% abutting the ventricular surface, and 43% in the frontal lobes); 100% (102/102 lesions evaluated with contrast) showed contrast enhancement. The median time from imaging to diagnosis for patients with no, single, multiple, or disseminated lesions was 32, 3, 5, and 3 weeks, respectively (P = .01). Patients with no or disseminated lesions were more often diagnosed at postmortem examination (P = .06). Imaging findings were practically unchanged during the consecutive 5-year periods. CONCLUSIONS: White matter periventricular contrast-enhancing single or multiple focal lesions were typical of non-AIDS PCNSL. No or disseminated lesions heightened the risk of delayed or postmortem diagnosis. Although the incidence of non-AIDS PCNSL has increased, its presentation at imaging remains unchanged. Early diagnosis is crucial for proper management of PCNSL and is more likely if tumor is observed on imaging.16 Visible tumor on imaging is essential to ensure an early brain biopsy and histologic diagnosis. In immunocompetent patients with PCNSL, unenhanced CT typically reveals hyper- or isoattenuated lesions.8,9,17–19 Most lesions are hypo- or isointense at unenhanced T1-weighted MR imaging and hyper- or isointense on T2-weighted imaging,8,9,17–20 and most lesions show marked contrast enhancement both at CT and MR imaging.8,9,17–22 However, these findings do not clearly differentiate PCNSL from other neoplasms (eg, metastases, malignant gliomas, meningiomas) or nonneoplastic diseases (eg, multiple sclerosis, stroke, pyogenic abscess). Perfusion-weighted MR imaging, proton MR spectroscopy, and fluorodeoxyglucose–positron-emission tomography (FDG-PET) reportedly may aid in distinguishing PCNSL from other lesions,19,23–25 but the role of these newer imaging methods in the diagnosis of PCNSL is not yet fully established. Imaging findings in PCNSL have mostly been investigated in single- or multicenter studies.15,17,18,21,22,26–29 To our knowledge, the present study is the first population-based study focusing on imaging findings in PCNSL and the first exploring changes in such findings with time. Improved CT and MR imaging have been suggested to explain some of the observed increase in incidence of PCNSL,30 and changes in imaging techniques have been shown to affect the detection rate and imaging findings of brain metastases.31 Thus, we hypothesized that the imaging presentation of PCNSL has changed with increasing incidence and advancing imaging technology. We also hypothesized that the imaging findings of PCNSL are related to clinical factors such as time to diagnosis or to the patient being diagnosed either alive or at postmortem examination. The aim of the study was to describe the following: 1) findings on CT and MR imaging at presentation of non–acquired immunodeficiency syndrome (AIDS) PCNSL in Norway during 1989–2003, 2) potential relations between such findings and clinical factors, and 3) possible changes in such imaging findings during the time period studied. The Regional Committee for Medical Research Ethics, the Directorate for Health and Social Affairs, and the Data Inspectorate approved this retrospective study and waived informed consent. In Norway (population, 4.2 million in 1989 and 4.6 million in 2003), there is mandatory cancer reporting to the Norwegian Cancer Registry, making the registration especially comprehensive. A list of all patients diagnosed with PCNSL in Norway from January 1, 1989, to December 31, 2003, was obtained from this national registry (n = 180). Clinical features, histologic diagnosis, radiologic findings, and medical treatment and outcome were registered. For the purpose of this study, histopathologic material, available in 103 of 104 patients having conclusive or possible non-AIDS PCNSL as a primary histologic diagnosis, was reviewed by 1 neuropathologist. Histopathologic material from a hospital managing 38 of the 103 patients was also reviewed by their local neuropathologist. Following chart review (n = 180) and pathologic review (n = 103), we included 98 patients with histologically verified non-AIDS PCNSL. Their pathologic review was based on review of biopsy and/or postmortem material (n = 96) or cytology (n = 2). The material was reclassified according to the current WHO classification (2001).32 Supplementary immunohistochemical and histochemical staining techniques (Giemsa stain, periodic-acid-Schiff, and reticulin stain) were performed when required to confirm the diagnosis and reclassify the lymphomas. As a minimum, the following antibodies were used for immunohistochemistry: CD20, CD79a, CD3, and Ki-67. A total of 82 of 180 patients were excluded due to AIDS-related PCNSL (n = 23), incorrect registration of PCNSL (n = 41) (extracerebral lymphomas, extradural intraspinal lymphomas, and other malignancies), or lack of histologic verification (n = 18). None of the included patients (n = 98) had signs of systemic lymphoma at initial diagnostic work-up with chest x-ray (performed in 94 patients, 96%), chest CT (n = 54, 55%), abdominal sonography and/or CT (n = 85, 87%), bone marrow biopsy (n = 67, 68%), or at postmortem examination (n = 27, 28%). All available CT and MR brain images of the included patients (n = 98) were compiled from treating hospitals and radiology departments. First CT and/or first MR imaging (no more than 2 months apart) performed at presentation before histologic diagnosis were reviewed. Hospitals in Norway are obliged to store radiologic material for only 10 years; thus, fewer patients had relevant images available for review during 1989–1993 (42%, 8/19) compared with 1994–1998 (87%, 33/38) and 1999–2003 (83%, 34/41). Among patients with relevant images available, 67% (50/75) had images stored on film and 33% (25/75, patients diagnosed during 1995–2003) had images stored in a PACS System. The films were collected and scanned. Images stored in PACS were compiled on CDs. All scans and CD images were imported into a digital imaging research archive. All together, 75 patients (35 male, 40 female) 13–83 years of age (mean, 64 years; median, 67 years) had primary imaging of the brain available for review and constituted the study sample. Four of these patients (5%) had received immunosuppressive medication for medical conditions (ulcerative colitis, renal transplantation, rheumatoid arthritis, and Wegener granulomatosis) before the first symptom attributable to PCNSL. Of the 75 patients in the study sample, 68 (91%) had contrast-enhanced imaging (including noncontrast series in 58 patients), whereas 7 (9%) had noncontrast series only. CT images were reviewed in 66 of the 75 patients (both contrast and noncontrast series in 46, only contrast series in 9, and only noncontrast series in 11). MR images were reviewed in 52 of the 75 patients (T1-weighted contrast and noncontrast series in 47, only noncontrast series in 3, only contrast series in 2; T2-weighed series in 48; fluid-attenuated inversion recovery [FLAIR] in 11); in 43 of the 75 patients, both CT and MR images were reviewed. For patients with both CT and MR images (n = 43), median (mean, range) time from the first imaging technique (CT in 39 patients, MR imaging in 4 patients) to the second imaging technique was 4 (8, 0–36) days. Median (mean, range) time was 6 (14, 0–206) weeks from first symptom to first imaging and 3(10, 0–125) weeks from first imaging to histologic diagnosis. Time of histologic diagnosis was the date of the diagnostic procedure (open biopsy, stereotactic or endoscopic biopsy, and cytology of CSF in 38 [51%], 24 [32%], and 2 [3%] patients, respectively) that led to histologic diagnosis or death in cases diagnosed postmortem (in 11% [15%] patients). A neuroradiologist with 25 years’ experience and a general radiologist with 8 years’ experience reviewed all CT and MR images in consensus by using a standardized registration form for each technique and having primary imaging reports available. 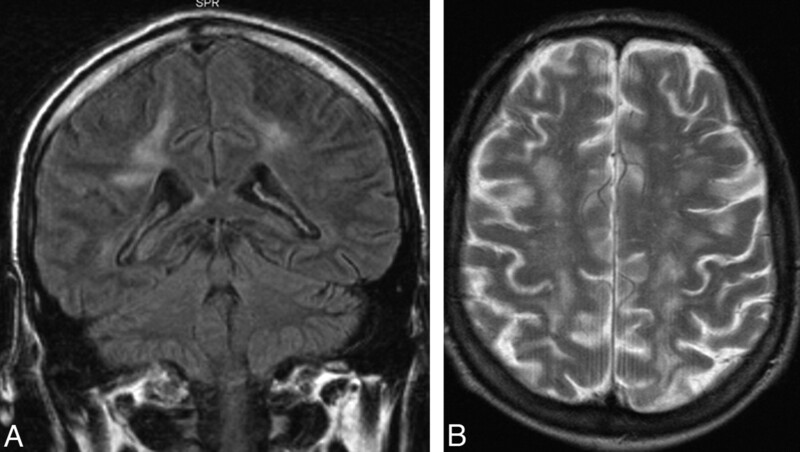 They characterized any lesions (numbers, size, location, margins, edema, mass effect, hemorrhage, attenuation/signal intensities relative to gray/white matter, and contrast enhancement) with the following findings: no lesion, single focal lesion, multiple focal lesions (a countable number), or disseminated lesions (ie, innumerable irregularly margined confluent lesions affecting multiple regions of the brain). Lesions abutting the ventricular/ependymal surfaces were noted as periventricular. Contrast enhancement was characterized for intensity (mild/pronounced), enhancement pattern (predominantly homogeneous/inhomogeneous), the presence of ringlike enhancement, and the existence of diffuse meningeal enhancement. Isolated diffuse white matter hyperintensity on T2-weighted series without detectable lesions on unenhanced or enhanced T1-weighed MR imaging series or both were considered “no lesion.” For patients having an imaging report available (n = 71), the agreement between reported and revised findings (at review) was very good (κ = 0.83) for no/single/multiple/disseminated lesions and perfect (100%, κ = 1.0) for no lesion/lesion (single, multiple, or disseminated). Imaging findings were evaluated separately for CT (n = 66) and MR imaging (n = 52) (on-line Tables 1 and 2). We further composed a dataset intended to reflect findings at CT and/or MR imaging in the whole sample (n = 75). For this dataset, findings at MR imaging were used when available. If MR imaging was performed without contrast series (n = 3) or after steroid treatment (n = 19) (which might have influenced imaging findings), findings at contrast-enhanced CT (before steroid treatment) were used instead. In 6 patients (of 75), only post-steroid treatment (median duration, 4.5 days; range, 2–13 days) imaging was available. These patients had undergone imaging before steroid treatment, but the images were unavailable for review (n = 5) or were unenhanced CT images only (n = 1). Possible associations between imaging findings and clinical variables were examined by using the Fisher exact test for dichotomous variables and the Kruskal-Wallis test for continuous variables. The Mantel-Haenszel exact test was applied to analyze time trends in dichotomous variables for the 5-year periods 1989–1993, 1994–1998, and 1999–2003. The nonparametric linear trend Jonckheere-Terpstra test analyzed time trends in continuous variables (number and size of lesions, time from first symptom to imaging, and time from imaging to histologic diagnosis). All P values in the analyses were 2-sided. The analyses were performed with the Statistical Package for the Social Sciences, Version 14.0 (SPSS, Chicago, Ill). The findings at review of first CT and/or MR images obtained after the onset of first symptoms attributable to PCNSL ranged from no lesion (13% of patients) to a single focal lesion (45%), multiple focal lesions (35%), and disseminated lesions (7%) (on-line Table 1, Figs 1–3). Lesions were most common in the frontal lobe (49% of patients) and the basal ganglia (32%, on-line Table 1). 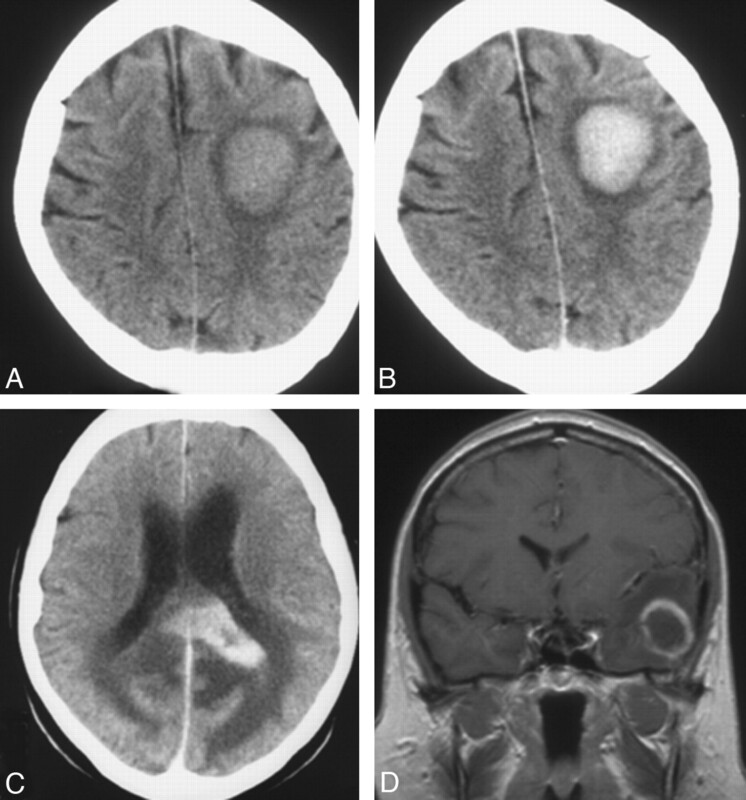 Concomitant hemorrhage in tumor was observed in 8% of the patients; one of these patients had tumor in a large chronic subdural hematoma (Fig 4A)—the hematoma had been diagnosed at CT 5 years earlier. The remainder had a small hemorrhage identified at noncontrast T1-weighted MR imaging (Fig 4B). Of the focal lesions (n = 103), 63% had white matter location only, 56% abutted the ventricular wall, 58% had sharp margins, and 77% were surrounded by edema (on-line Table 2). Of focal lesions imaged with contrast series (n = 102), all enhanced; 13% showed ringlike enhancement (on-line Table 2 and Figs 1D and 2A). 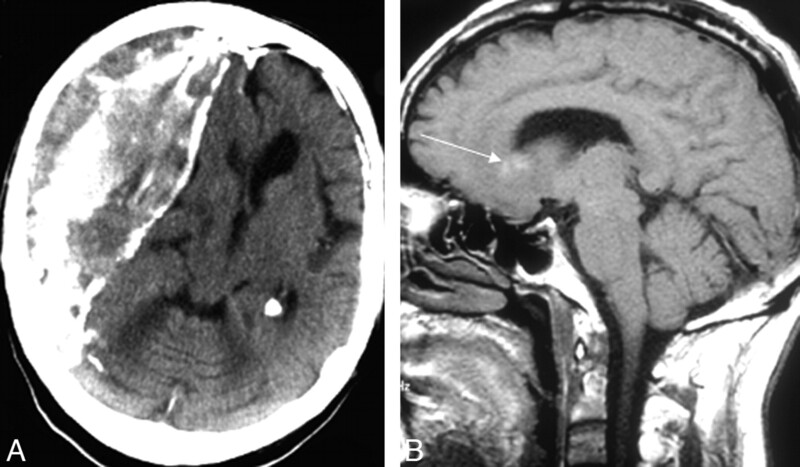 Single lesion at CT (A−C) and MR imaging (D) in 3 patients: a hyperattenuated lesion in the frontal lobe on noncontrast CT (A) with marked enhancement at contrast-enhanced CT (B). C, Marked contrast enhancement is seen in a lesion in the corpus callosum. D, Focal lesion has ring enhancement in the left temporal lobe on coronal T1-weighed contrast-enhanced MR imaging. Multiple focal lesions (2 lesions on A and B, 3 lesions on C and D) at contrast-enhanced T1-weighted MR imaging in 4 patients. 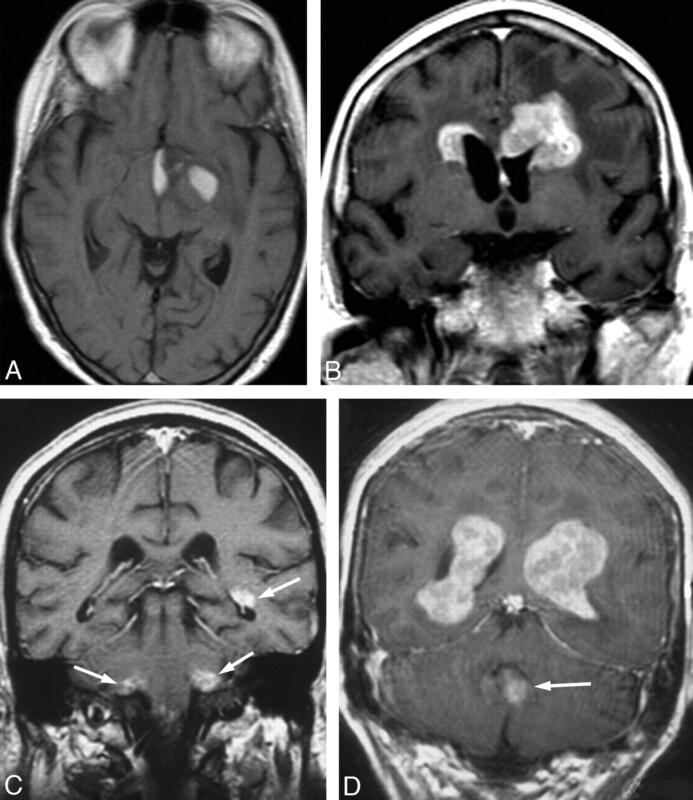 Note lesions in the basal ganglia (A), frontal lobes (B), cerebellum and temporal lobe (arrows, C) and intraventricular lesions in the lateral ventricles and fourth ventricle (arrow, D). On noncontrast CT, 63% (48/76) of lesions were homogeneous and 100% (76/76) were iso- or hyperattenuated relative to white matter. None of the lesions showed calcifications. At noncontrast T1-weighted MR imaging, 99% (64/65) of lesions were hypo- or isointense relative to white matter and 96% (67/70) were iso- or hyperintense relative to white matter at T2-weighted imaging. All patients with disseminated lesions (n = 5) had involvement of the frontal lobes, temporal lobes, and basal ganglia (Fig 3), and all had lesions bordering the ventricles and lesions with pronounced enhancement (inhomogeneous in 3 patients). Notably, edema and mass effect were mild or absent in all these patients. Disseminated lesions in 3 patients demonstrated at contrast-enhanced MR imaging; axial and coronal images are shown in 1 patient (A and B) and axial images, in 2 patients (C and D). Among 10 patients with no lesion at first imaging (contrast-enhanced MR imaging in 3, contrast-enhanced CT in 2, and noncontrast CT only in 5), findings in 5 were normal and 5 had findings of cerebral atrophy, old infarction, subdural hematoma (Fig 4A), hydrocephalus, and diffuse white matter disease (Fig 5), respectively (on-line Table 3). Eight of the 10 patients underwent renewed imaging. 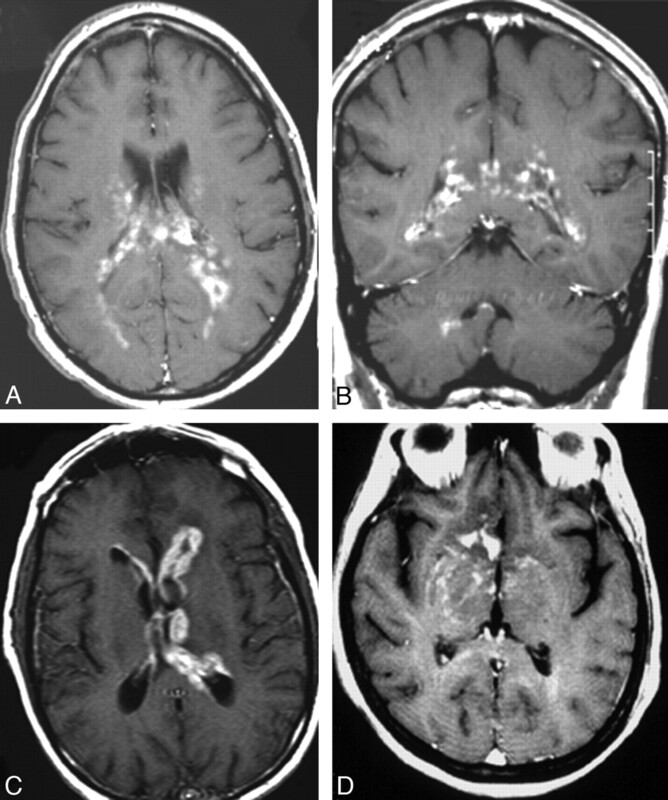 Follow-up studies 20–35 weeks later in 6 patients (contrast-enhanced CT in 4 and contrast-enhanced MR imaging in 2) identified multiple lesions in 3, a single lesion in 2, and meningeal contrast-enhancement in 1, leading to histologic diagnosis before death. In 2 patients, renewed imaging (plain CT in 1 and contrast-enhanced MR imaging in 1) 12–57 weeks later added no new findings (on-line Table 3). A, Large chronic partly calcified subdural hematoma on noncontrast CT. B, Another patient has small high-intensity areas within the lesion on noncontrast T1-weighted MR imaging regarded as minor hemorrhage (arrow). Coronal FLAIR (A) and axial T2-weighted (B) MR images showing diffuse white matter hyperintensity in a patient with isolated intravascular large B-cell lymphoma. At primary imaging, diffuse meningeal contrast-enhancement occurred in none of the patients having undergone contrast-enhanced CT (55 patients) or MR imaging (49 patients). Whether the diagnosis was established while the patient was alive tended to differ among patients with no, single, multiple, and disseminated lesions (P = .06, on-line Table 4). Only 60% of the patients with disseminated lesions and 70% of the patients with no detectable lesion were diagnosed while alive versus 94% and 85% of those with single and multiple lesions, respectively (on-line Table 4). Symptoms were similar in patients with no, single, multiple, and disseminated lesions (on-line Table 4). Median time from imaging to histologic diagnosis was longer for patients with no lesion on imaging (32 weeks versus 3, 5, and 3 weeks for patients with single, multiple, and disseminated lesions, respectively; P = .01, on-line Table 4). Open (n = 35), stereotactic (n = 21), or endoscopic biopsy (n = 3) was performed in 59 of the 65 patients with lesions (single/multiple/disseminated) at first imaging. The biopsy tended to be more often nondiagnostic in patients with multiple lesions (P = .06, on-line Table 4). Steroid treatment before biopsy was not more frequent among these patients (on-line Table 4). The nondiagnostic biopsies (n = 9) were open biopsies (n = 4) and stereotactic biopsies (n = 5). Due to pathologic findings at renewed imaging, 7 of the 10 patients with no focal lesion at primary imaging had an open biopsy (n = 4), stereotactic biopsy (n = 2), or cytology of spinal fluid (n = 1) performed; these were all diagnostic. Ringlike enhancement was significantly associated with immunosuppression; 3 of 4 (75%) immunocompromised patients had lesions with ringlike enhancement versus 6 of 71 (8%) immunocompetent patients (P = .01). The relative proportions of patients with no, single, multiple, or disseminated lesions at CT and/or MR imaging did not change significantly with time (on-line Table 4). The lesions had smaller median diameters during the last 5-year period (22 versus 30 mm during each of the 2 preceding 5-year periods; Jonckheere-Terpstra test for linear trend, P = .048). For all other variables regarding location, margins, edema, mass effect, and contrast enhancement of lesions (variables listed in on-line Tables 1 and 2), no significant time trends were observed (P > .05). This population-based study confirmed that typical imaging findings of PCNSL are single or multiple focal contrast-enhancing lesions in periventricular white matter.8,9,15,17–22,26–29,33 It further showed that no or disseminated lesions tended to make early histologic diagnosis less likely. Imaging findings in non-AIDS PCNSL remained largely unchanged with time. These results might well apply to patients presenting with PCNSL at a radiology department in a standard clinical setting because the study was population-based and included patients diagnosed after death. As many as 10 (13%) of 75 patients had no lesions at first imaging (on-line Table 3). These patients most likely had PCNSL at the time of the initial scanning, though this cannot be unequivocally proved. All (except 1 with headache for >3 years) were formerly healthy and were imaged due to new symptoms. Five of the 10 patients underwent noncontrast CT only at first imaging. Thus, relevant lesions might easily have been overlooked, and additional contrast series might have added valuable information. However, negative findings on CT with contrast do not exclude PCNSL.8,19 Five patients had no lesion at contrast-enhanced imaging; at renewed imaging, all except 1 of these had focal lesions or meningeal enhancement that eventually led to the diagnosis of PCNSL (on-line Table 3). Early renewed imaging may prevent diagnostic delay. Hemorrhagic lesions, another atypical finding in PCNSL, also occurred more often in our study than in some materials (in 8% versus 2%–4% of patients).18,41 Small intratumoral hemorrhages were most common (prevalence, 7%; Fig 4); this was also the case in a smaller study33 in which small hemorrhages occurred in 4 (21%) of 19 lesions. The tendency of fewer diagnostic first biopsies in patients with multiple lesions is difficult to explain. Steroid treatment can cause nondiagnostic biopsies9 but was not more frequent in patients with multiple lesions (on-line Table 4). Also, patients with single-versus-multiple focal lesions had similar-sized lesions biopsied (median largest diameter, 37 versus 36 mm; P = .32) and similar modes of biopsy (open, stereotactic, endoscopic; P = .23). One limitation to our study is that only 42% of patients from 1989 to 1993 had images reviewed. Yet, the results for 1994–1998 and 1999–2003 should be representative, because images were reviewed in 87% and 83% of the patients, respectively. Also, results for time trends were largely unchanged in an analysis restricted to the 2 last time periods. This and the stable imaging findings over time in the entire study make it unlikely that unavailable images have substantially biased our results on imaging findings. In this population-based study, non-AIDS PCNSL typically presented with contrast-enhancing single (45%) or multiple (35%) focal lesions. No or disseminated lesions (20%) resulted in later histopathologic diagnosis. The first imaging should include a contrast-enhanced MR imaging series to ensure early diagnosis of PCNSL. Early renewed imaging should be considered when first imaging findings are negative and symptoms persist. In the era of increasing incidence of non-AIDS PCNSL, its features on imaging remain unchanged. We thank all the institutions that made possible the review of the medical records, histologic material, and radiologic examinations and David Scheie, MD, for his contribution to the histopathologic review. National Comprehensive Cancer Network. NCCN Clinical Practice Guidelines in Oncology: Central Nervous System Cancers, 2007. Available at: http://www.nccn.org/professionals/physician_gls/PDF/cns.pdf. Accessed November 19, 2007.